Carrot Fudge (Recipe from Colleen Moulding's "Frugal Recipes from Wartime Britain"). Put the carrots in a pan and cook them gently in just enough water to keep them covered, for ten minutes. Add a little orange essence, or orange squash to flavour the carrot. Melt a leaf of gelatine and add it to the mixture. Cook the mixture again for a few minutes, stirring all the time. Spoon it into a flat dish and leave it to set in a cool place for several hours. When the "fudge" feels firm, cut it into chunks and get eating! "Doctor Carrot" arrived in November 1941. The Ministry of Agriculture promoted carrots heavily as a substitute for other more scarce vegetables and meat, and as a sweetener in desserts in the absence of sugar, which was rationed to 8 ounces per adult per week. The Dr. Carrot character carried a bag labelled "Vit A" as the Ministry of Food recognised the value of the carrot in providing high levels of this vital vitamin, via beta-carotene. People were encouraged to "take the doctor's advice" and eat more carrots to be fit for the ensuing winter. It was reported that the shortage of batteries would no longer be a concern as people would "develop cats eyes" and see better in the dark. Carrot were considered to be the most important of vegetables from a health point of view and it was hoped that Dr Carrot would carry out his mission as successfully as Potato Pete did for the potato. During the 1940 Blitzkrieg, the Luftwaffe often struck under the cover of darkness. In order to make it more difficult for the German planes to hit targets, the British government issued citywide blackouts. The Royal Air Force were able to repel the German fighters in part because of the development of a new, secret radar technology. The on-board Airborne Interception Radar (AI), first used by the RAF in 1939, had the ability to pinpoint enemy bombers before they reached the English Channel. But to keep that under wraps, according to Stolarczyk’s research pulled from the files of the Imperial War Museum, the Mass Observation Archive, and the UK National Archives, the Ministry provided another reason for their success: carrots. In 1940, RAF night fighter ace, John Cunningham, nicknamed “Cat’s Eyes”, was the first to shoot down an enemy plane using AI. He’d later rack up an impressive total of 20 kills—19 of which were at night. According to “Now I Know” writer Dan Lewis, also a Smithsonian.com contributor, the Ministry told newspapers that the reason for their success was because pilots like Cunningham ate an excess of carrots. 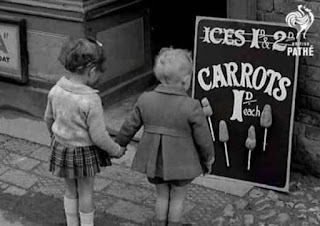 In February 1941 the Minister of Food gave his monthly report on the food situation in the UK and stated "That the consumption of carrots has increased following the Ministry's publicity campaigns. Supplies are still ample." In wartime Britain children would very often use the humble carrot as a substitute for the fruit they could no longer obtain. 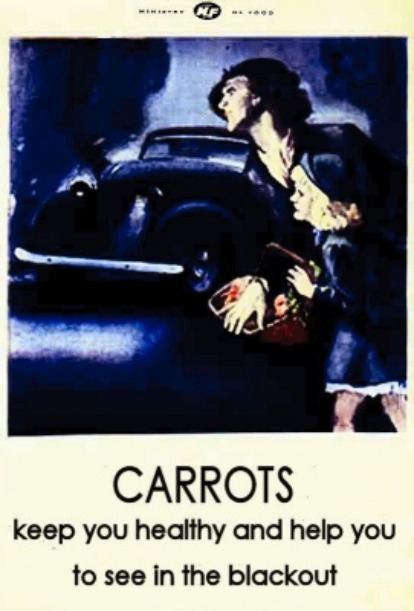 Similarly the Government also issued a poster with the slogan 'Carrots keep you healthy and help you see in the blackout' to promote the humble carrot. 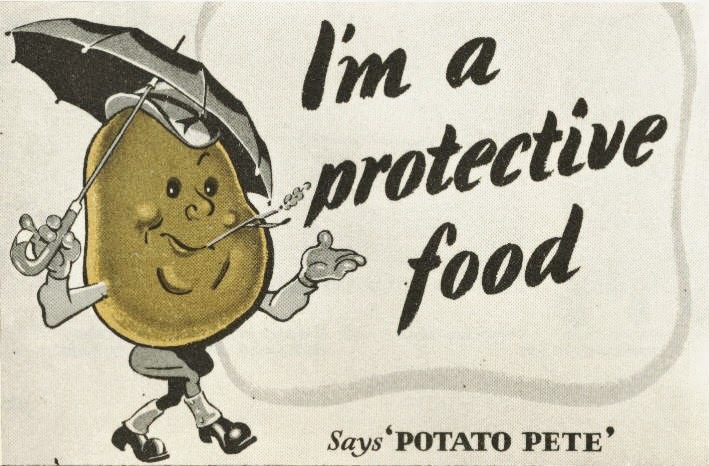 Potato Pete was one of the characters devised by the Ministry of Food to encourage the public to eat more healthily during the war years. 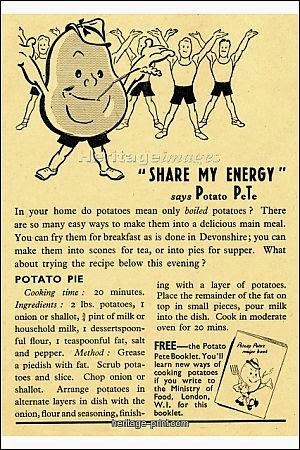 Pete was created in order to encourage people to eat more potatoes rather than grains like wheat as these were imported from America whereas the potato was home grown. In 1941 Walt Disney tried to help the British war effort by sending some vegetable cartoons to the ministry. But Potato Pete and his friend Dr Carrot were already so popular the Disney figures were rejected. Potato Pete also had his own recipe book that showed the public a number of recipes using the humble potato. A copy of Potato Pete's Booklet can be found online here. 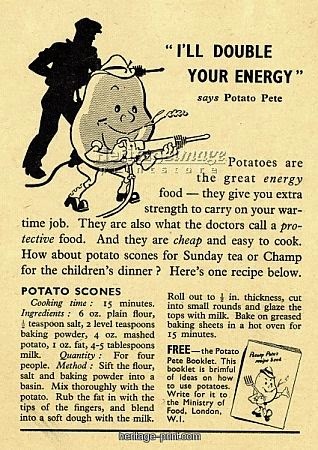 This week I'm going to concentrate on healthy eating in wartime. 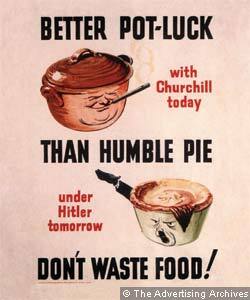 With the onset of rationing British eating habits improved. Rationing meant everyone was getting their fair share, rich and poor alike. As intake of unhealthy food like white bread and sugar were cut or greatly reduced by rations people were generally more healthy throughout the war years. The Ministry of Food released information on how to eat a well rounded nutritionally balanced diet in many different mediums. People were encouraged to grow their own vegetables and fruit. Which not only guaranteed them a diet rich in fruit and vegetables but also meant they got exercise while maintaining their victory gardens. The Ministry came up with two characters 'Potato Pete' and 'Doctor Carrot' that encouraged people to grow and eat more vegetables. Well we've come to the end of recipes week but keep checking back throughout the year as I will update this section regularly with any wartime recipes I try. Don't panic if large numbers arrive, you can dump almost anything into your original dish to spin it out, just like the miracle of the loaves and fishes. Oatmeal, tapioca, rice, vegetable tops, chutneys or soups can substantiate any meal. Pre world war two white bread was universally eaten and any other type was viewed with suspicion. However most of the flour used to make this bread was imported from abroad. With the outbreak of war German u-boats started blockading merchant ships with these kind of imports from getting into Britain. So in 1942 the government introduced the National Wheatmeal Loaf which used all of the wheat grain including the husks. It also had added calcium to prevent rickets. The loaf was dense with a dirty grey colour and was unpopular with a population used to white bread. It quickly gained the nickname 'Hitlers secret weapon'. Bakers were banned from making any other type of bread except the national loaf. The Federation of Bakers was formed, to assist in organising the wartime production and distribution of bread. 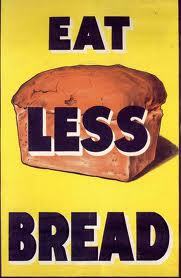 Sliced bread was also banned as it was seen as a waste of energy. Eating just what I should. 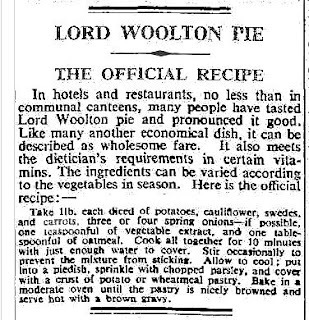 Woolton pie was created by the head chef of the Savoy Hotel and named after the Minister of Food Lord Woolton. 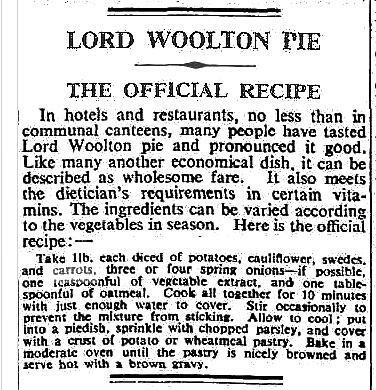 The dish was one of the many recipes recommend by the Ministry of Food to help people maintain a nutritional diet despite shortages with rationing. 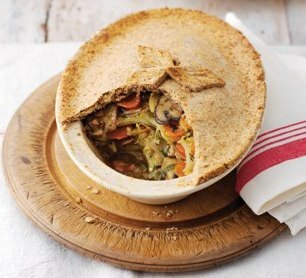 The pie was created with rationing in mind as it contained no meat. The dish was not very popular after the war and was quickly forgotten when conditions returned to normal.